Thursford is a tiny but picturesque village near the wonderful North Norfolk coast. Every two or three years we open our gardens to raise money for St Andrews, our quite famous church with a stained glass window which is documented in Pevenser. This year the event, which is justly well regarded is on Sunday 8th June. The gardens of Thursford are really beautiful in that English country garden sort of way. 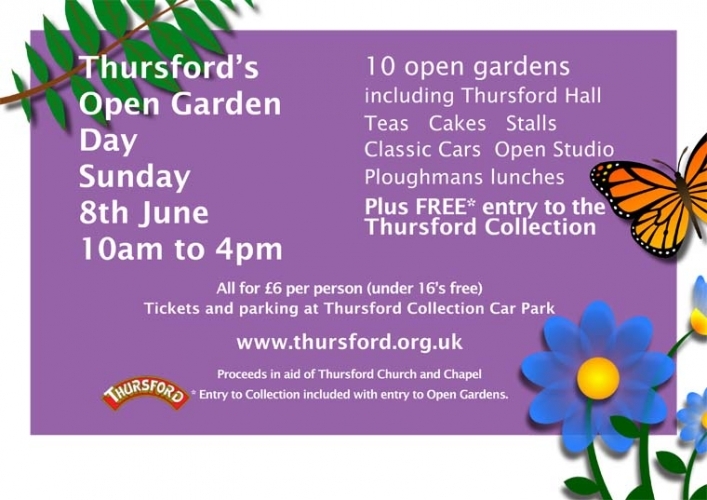 We always combine the event with the local Thursford Collection, a fabulous museum full of steam engines, galloper rides and lovely grounds, this year Thursford Old Hall is opening as well , they have a nascent vinery with champagne making grapes. Visit the gardens, come to the antique chandelier and lighting showroom at Norfolk Decorative Antiques and go to the coast, a brilliant weekend!